What makes it better? Quite a bit, in controllability, speed, serviceability, and equipment life. The features that set this winch apart are the brake-off capability, the high line pull and speed, the increased wire rope capacity, and its plug-and-play design. Let's start with the internals. The H6H comes with a new feature—brake-off, achieved through an oil-bath, multi-disc brake-off clutch. The brake-off function allows the tractor to drive away from the tethered load while keeping the wire rope taut, to prevent the wire rope from "bird-nesting." This helps increase productivity in areas of poor ground condition. Like the H6G, the motor remains internal to the winch, safely tucked away from damage. The H6H uses a heavy-duty bent-axis, variable displacement piston motor to support the higher pressure requirements of the new generation of hydrostatic dozers. This motor provides a continuously variable speed control to the wire rope, which helps the operator do precise load setting. The motor also delivers higher efficiency, which puts more horsepower to the wire rope, yielding higher line speed at a given line pull, particularly so in the prime operating range. There are some important changes on the exterior of the winch as well. First, the drum has been widened by 1.0 inch (2.5cm), to increase its wire rope capacity by 10 percent. The wider frame retains the same profile, so that H6G and W6G fairlead and integral arch can be used on H6H. Despite all the changes, the H6H winch retains the advantage of "plug-and-play" design. The winch comes with everything you need for a complete and tidy installation. Installation time for the winch is quick. Just bolt the winch to the dozer rear face and connect the hydraulic lines and you're on your way. The Komatsu D65-16 powers the H6H winch through an auxiliary hydraulic ripper circuit that is a standard feature on all D65-16 variants in North America. The Komatsu ripper circuit delivers the high pressure and high flow rate needed to produce good winch performance for demanding applications. The John Deere 750J and 850J continue as before, with an optional factory-installed high-flow pump dedicated to powering the winch, delivering high performance. One of the more interesting aspects of this new winch is in its control logic, which gives the operator a better feel over the load and more confidence in handling heavy loads on slopes. From a dead stop, the Allied H6H winch starts off with slow speed, smoothly ramping up to higher speed as conditions permit, which makes for extremely smooth starts. 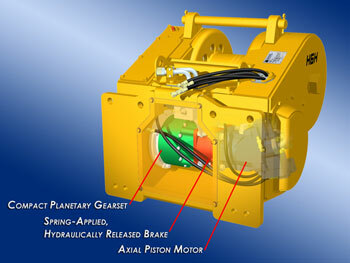 This contrasts with other winches on the market, which are configured the opposite way. They start fast and revert to low speed under load, which could lead to a jerky start while hunting for the proper setting.